Get your cover letter noticed today. The following cover letter sample would help you to create a professional level resume. 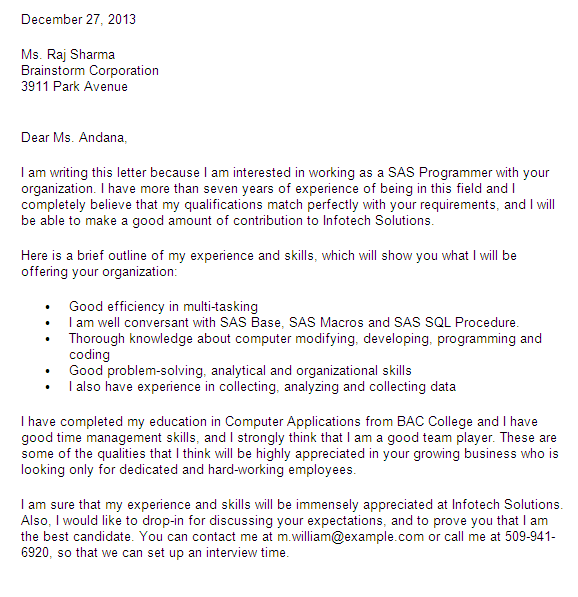 5 Responses to "Cover Letter For SAS Analyst / Programmer"
I'm not sure that other people's examples will help me write my wonderful resume. The fact that they are good for someone does not mean that they will be good for me, because we are all individual. If I decide to change a job or update my resume, I go to get help from the special services (here you can read a description of my favourite one - https://top5resumewriting.services/proresumewritingservices-com-review/) and they make a perfect resume for me, highlighting MY my best sides. One of the main things of launching career successfully lies in the fact that one should have a really good resume before starting seek for a job. Hopefully now every person can ask for professional help such as https://craftresumes.com/ and not be worried about it.